Put the pears, juice and sugar in a pot making sure the pears are completely covered (add more juice and sugar if need be). Bring the mixture to a boil and on a lower flame wait for it to simmer. 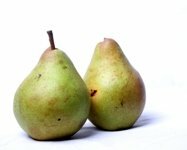 Cover with a lid slightly opened and cook for 20 minutes or until the pears are firm but no longer crunchy. Serve with a scoop of ice cream or by themselves, doused in the cooked liquid. 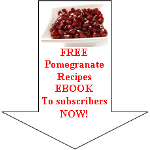 Read enough about poached pears and want to discover more pomegranate recipes?